To begin with Mango Musk Melon Chia Seeds Pudding, take mango and musk melon pulp into a large bowl and add the milk. Blend the mixture using a hand blender till everything is mixed properly. Take the smoothie in a large bowl, add chia seeds and pistachios, whisk well to combine. Cling wrap and refrigerate for 4 hours minimum. To serve, spoon the pudding into the bowls, top it with banana and mango slices, sprinkle some pistachios, drizzle a little honey and serve. 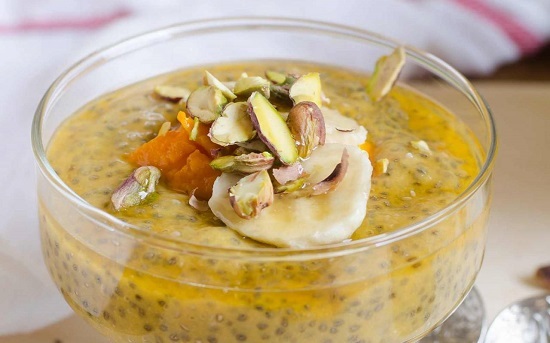 Serve Mango Musk Melon Chia Seeds Pudding with some fresh fruits for your breakfast. Mango Musk Melon Chia Seeds Pudding is a yummy recipe which is made with fresh seasonal fruits blended with a little milk, mixed with chia seeds and toasted nuts. This recipe is quick and very easy to make. Just freeze it, garnish with some fresh fruits and it is ready to be served. A perfect sweet dish when you have guests at your home or a healthy breakfast.